Carl began his career as a financial advisor in 1986. Nearly 40 years later Carl continues to work with his clients on a daily basis. He is a natural mentor and is able to provide guidance to clients regardless of their stage of life. Carl offers his wealth management services from his offices located within the Members 1st and Siskiyou Credit Union. Carl’s experience is not exclusive to the time he has been a financial advisor. He is a US Air Force veteran and currently is a volunteer with the US Coast Guard holding various ranks during the last decade. In the moments when he is not serving our country or his clients, Carl enjoys being an active participant in the community of the Church of the Nazarene in Redding. 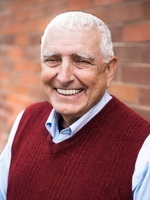 Some of Carl’s additional past (and present) endeavors include his membership with Lions Club International, participation with Living Hope Compassion Ministries and his work at the Cascade Theatre. A wonderful kid at heart, Carl has been a member within the Shasta High School Music Department and a leader of student trips to Europe. A good financial advisor can relate to his clients through understanding the unique aspects of each of their lives. Carl’s travels and endeavors have given him wisdom to understand people in a personal way. This understanding is a central theme in the advice that he offers.